[New for 2013] Part of the free blue bunny shipment included the latest edition to their mini champ lineup. 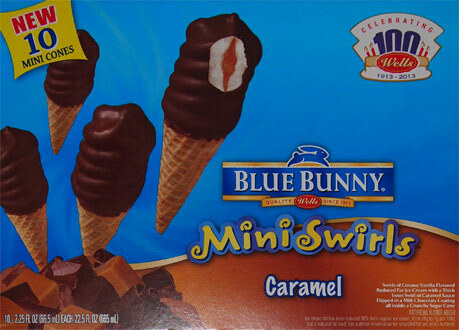 I do love cones, and blue bunny's versions haven't disappointed in the past. DOH! Wait! I just realized they aren't called Champ! Mini Swirls anymore. They've dropped the Champ! 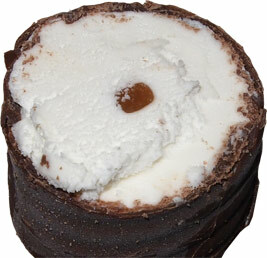 from the mini cones and are using it on their full size cones only. Yeah, that makes sense. The champ is big and powerful, the mini swirls are cute and little. Anyway, there's something about the box design that bothers me, so let's focus on that big logo in the top right corner reminding us that Blue Bunny is granting 100 wishes for it's 100th birthday! Alright, so this very well labeled Caramel Mini Swirl is "swirls of creamy vanilla flavored reduced fat ice cream with a thick inner swirl of caramel sauce dipped in milk chocolaty coating all inside a crunchy sugar cone". Hehehehe, I love the fact they point out that it's a CRUNCHY cone. That's priceless. Mmmmm, mini ice cream cones.... how I love to snag one on my way to work. Now why did I photograph the only cone that was cracked? I have no idea. I don't know what it is about these little cones, but I can't get enough of them. Everything just comes together really nicely. Everything is in the right ratio. I try to start by enjoying the shell. If you savor it, it dissolves into this neat gritty milk chocolate coating on your tongue. There's the neat hit of caramel in the middle that's not too strong but it adds a sweet and subtle note to this mini treat. Next we have a nice thick crunchy cone. Last but not least is the respectable vanilla tying it all together. Oh sure, I can devour this in about 4 bites, but I try to go slow. I've only got one or two left but I know I'll be buying another box to cure my summer time cone needs. I really dug the plain mini champs and I think the hint of caramel accentuates the cone just a little more. Boy do I like these! Glad to hear how great these are! I've been thinking about cones too lately - I'll have to snag a box! honestly, I'd be more tempted to throw together an icecreamsource.com order every month so you'd have more control over what you get. be aware that a lot of the selection was just midwest ice creams that arent available to the rest of the country.